I am sand, and I live beside the ocean. I spend my days treading the beach looking for that special spot where I'll be most useful. One day, as I settled myself amidst some beautiful rocks that glistened with rays from the setting sun, I noticed a particularly sparkly object laying subtly on the rocks not too far ahead of me. It was a pleasant sight that I relished for a moment. But before I could give it a second thought, the tides came in and the pulsing ocean reclaimed it. Some years later, as I sat on the beach taking in the refreshing air, I glanced to my right and noticed it again. At once I knew that we had met before, but this time it seemed more enchanting than I had remembered. It was during this gracious encounter when I realized that the object of fascination was in fact a pearl, a golden pearl. I approached it slightly and then retracted. Gems of this type are not left alone for the likes of me to claim. Nonetheless, I stayed close by until night fell and it once again disappeared from sight. Thereafter its memory could not be forgotten thus indicating that a closer encounter was inevitable. When it occurred, thoughts that this may be an ordinary stone or shell that simply had its own charm was dispelled. No, this really was a pearl, but it hid itself well. 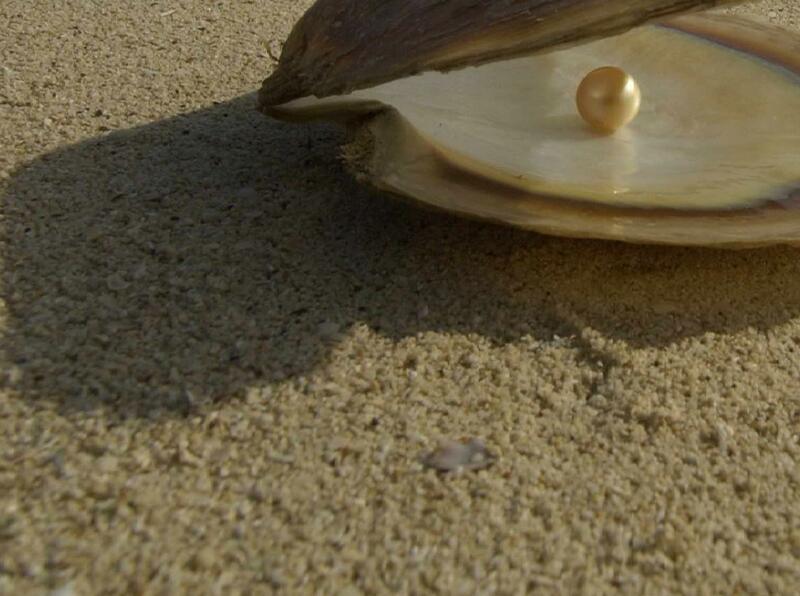 This pearl that perhaps was as ordinary as other shiny objects could only be seen clearly when resting in my midst. But again, I reminded myself that I was unfit to keep it from the ocean. I loosened my sandy embrace, and with a final sparkle it easily slipped back into the engulfing waves. I often visit this part of the beach hoping for at least a glimpse of it, but hopes of such an occurrence are fanciful and unrealistic. Perhaps it's better that I close my eyes and savour the thought as a dream while I leave reality to take its destined course. mashallah great talent you have shown in your writings. Alhamdulillah wa shukr lillah... sometimes a bit of heart is is erringly perceived as talent .. Either way, jazakAllahu khayr.